Sri City, October 24, 2016:- A 40 member high level investment delegation of China’s leading Mobile Industry service platform and tech media Mobile World (Shoujibao), comprising senior executives of some of the prominent Mobile Phone brands and mobile phone industry chain visited Sri City on Monday. Mr. Ravindra Sannareddy, Founder Managing Director, Sri City extended a warm welcome, and briefed the delegates on the infrastructure and the unique features of Sri City. Sharing their experiences with the delegates, senior executives of some of the Chinese companies in Sri City, viz ZTT, Longi and Rising Star (Foxconn) said that the favourable business environment coupled with the required infrastructure, talent pool and government support attracted them towards Sri City. Following the briefing session, the delegates went round the campus and visited the production plants of ZTT and Pals plush, which are from China. They all expressed in unanimity that facilities and infrastructure are highly impressive and inspiring, and hence they would give preference to invest in Sri City. The intent of their visit is to learn about the complete supporting facilities and services that are offered by Sri City, Which is one of the largest manufacture city of India. Sensing a big manufacturing opportunity in India and an endorsement for the Indian government’s ‘Make in India’ vision, Chinese companies target India as one of the hottest next destination to set up their manufacturing base. 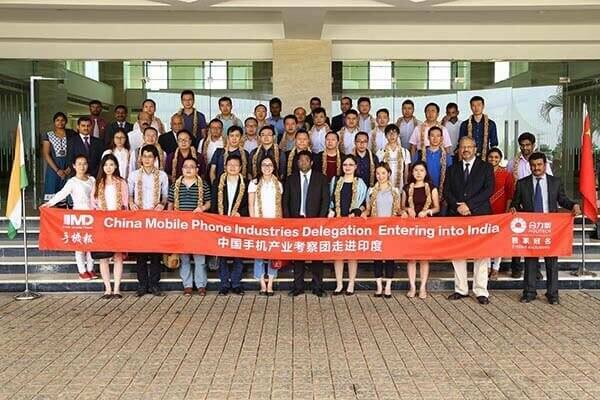 A large delegation of top Chinese mobile phone and component companies is on a tour to India for participating in the Mobile Diwali Expo, organised by Mobile World (Shoujibao) at New Delhi during October 22-24, 2016. They had meetings with the stakeholders of Indian mobile industry so as to have a detailed understanding of Indian law, tax, customs and to know India’s brands better, and therefore invest wiser to achieve a win-win situation.